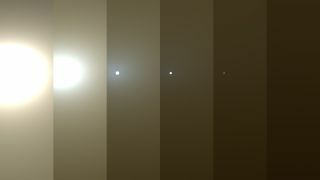 This series of simulated images shows how conditions have changed around NASA’s Mars rover Opportunity as a huge dust storm has intensified throughout June 2018. At left, the sun appears blindingly bright but darkens as the dust storm intensifies. At the far right, the sun is a mere pinprick, with the dust storm in full swing. NASA's Opportunity rover on Mars did not return a call from Earth Tuesday (June 12) while enduring a massive dust storm that scientists have called "one of the most intense ever observed."